It was a long journey for the Castle region to be designated as a provincial park. Not only has the Castle-Crown Wilderness Coalition been advocating for the sustained protection since 1989, but individuals from all backgrounds have contributed to this journey in their own ways. Two of these individuals are Bert Riggall and Andy Russell. 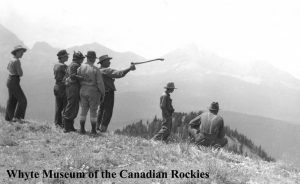 Their contributions to the conservation of southwestern Alberta were founded on a passion for nature and the outdoors. And now their legacies are an inspiration. Small actions – from words to pictures – can leave a lasting heritage for generations to come. This story begins in 1905. Bert Riggall – who was born in 1884 in Lincolnshire, England – arrived in southwestern Alberta to work as a ranch hand and land surveyor. With experience as an athlete and naturalist, Bert began offering guided hunting and fishing trips in the region. 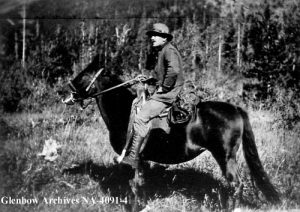 He married Dora Williams in 1906 and the couple started a ranch nearby Waterton Lakes National Park. On their tours, Dora was the cook and Bert was the guide. Bert also went on numerous significant exhibitions, including towards the Yellowhead Pass in B.C. and along the Oldman River. Bert’s practical knowledge was paired with his impressive understanding of the natural world. His knowledge of botany, zoology and geology was particularly useful around the campfire and as a writer for magazines. In addition to writing, Bert was a photographer for both magazines and the federal government. Born in Lethbridge in 1915, Andy Russell lived in the region for his entire life. As a child, he lived on a ranch near Pincher Creek. Andy became an experienced outdoorsman and was employed by Bert in 1935. This relationship extended far from just business. Andy married Kay Riggell in 1938 and moved onto the Riggell’s ranch, and the couple had five children. Andy’s career had many parallels to his father-in-law. He guided many exhibitions in the area and led hunting, fishing and wilderness trips until 1960. After that, Andy focused on writing, photography and even making films to showcase the wildlife and landscapes of southwestern Alberta. Bert Riggall and Andy Russell both started their careers as outdoor enthusiasts. 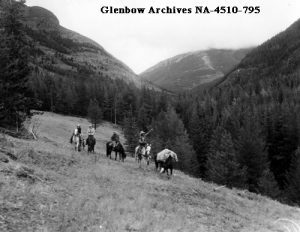 They explored southwestern Alberta and created a living by sharing the area to guests from nearby and far away. 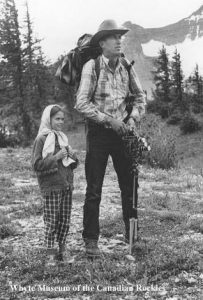 Their legacies are founded on the writing, photographs and videos that were created throughout and after their lives as guides and outfitters. But that legacy is not based on perfect photographs and expert writings; their passion for conservation is the underlying factor. Andy’s legacy is noteworthy. His books, articles, photographs and videos have become pinnacle works in environmental advocacy. In 1977, he was awarded the Order of Canada and Premier Ralph Klein spoke at his funeral in 2005. Russell and Riggall are only two of the many individuals that have contributed to the lasting protection of the Castle area through a deeper appreciation of the region’s natural, historical and cultural significance. Follow their footsteps to continue to promote the conservation and appreciation of this amazing place.